Nintendo’s new miniature SNES Classic system is here, and it’s a historically significant release for one big reason: Star Fox 2. 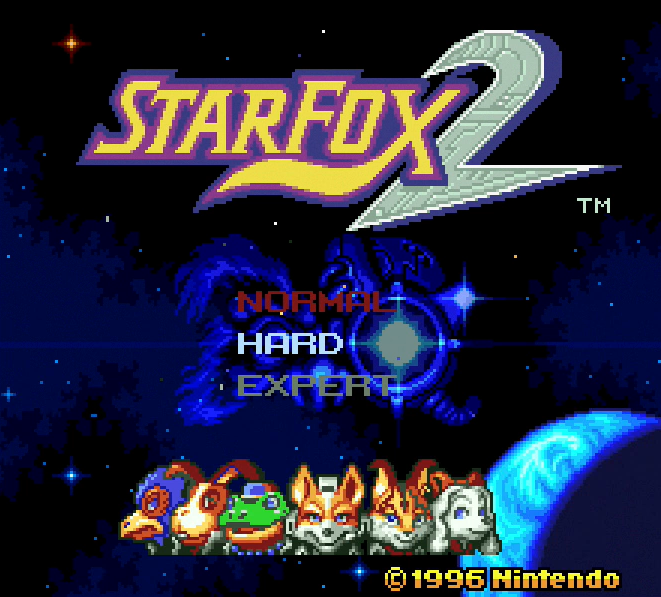 Fully developed but never released due to its completion near the end of the SNES’ lifespan (and the subsequent birth of the Nintendo 64), Star Fox 2 has existed in limbo for a long time now. A few times over the years, ROMs claiming to be the full game have shown up, but they’ve generally been early alpha or beta builds, not offering quite the full experience that Nintendo originally intended for the game. Now, in 2017, we can finally play Star Fox 2 in its original form as it was always intended to be played. Was it worth the wait? Remember how the original Star Fox was firmly on rails, effectively adopting the side-scrolling shmup formula and projecting it into 3D? Yeah, forget everything you know about that. 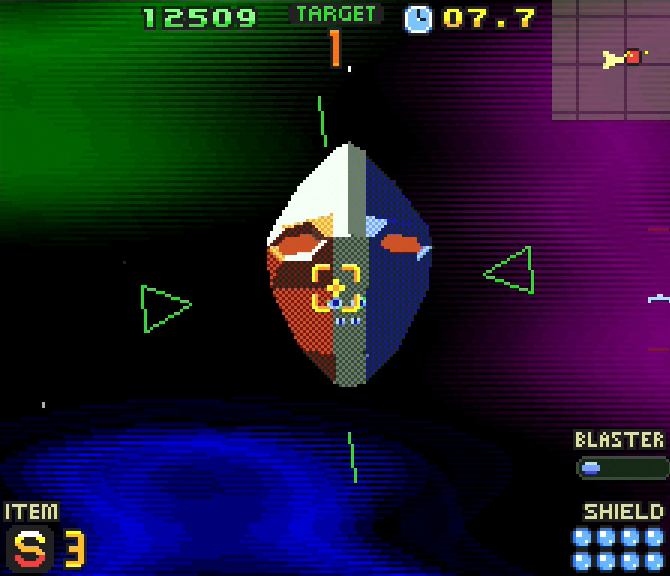 Star Fox 2 is a very different beast. 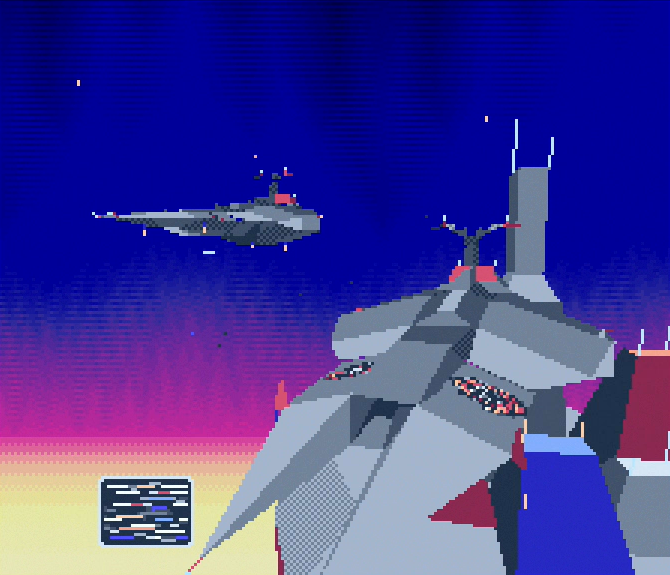 In fact, Star Fox 2 defies easy pigeon-holing. I mean, obviously it’s still a sci-fi shoot ’em up with early low-poly 3D graphics, but it’s also a lightweight strategy game with randomised elements and a strong emphasis on speedrunning. And a dogfighting sim. And a third-person shooter. 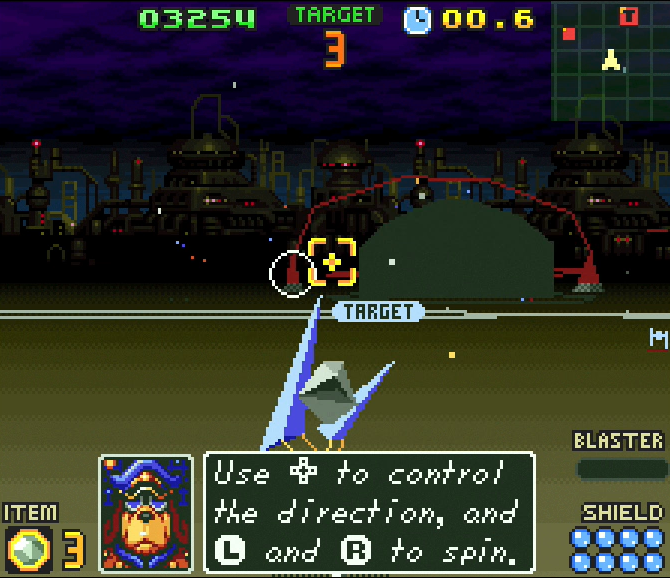 Unlike some of the more recent Star Fox games, however, Star Fox 2’s disparate elements all work well together and create a coherent experience that, while visually very dated — particularly in the frame rate department, where the dear old SNES really struggles a bit — is enormously fun, immensely replayable and incredibly addictive. Here’s how it all works. Andross apparently wasn’t quite defeated well enough at the end of Star Fox, so now he’s back and extremely pissed off at the planet of Corneria and the Star Fox squad in particular. As such, he’s taken over several planets of the Lylat system — randomly determined each time you start a new game — and is now proceeding to fling missiles, fighters, battlecruisers and all manner of other unpleasantness at poor old Corneria. It’s up to Fox and his team — now including two new furry female members besides the old gang — to defend the planet from the onslaught and take the fight back to Andross. 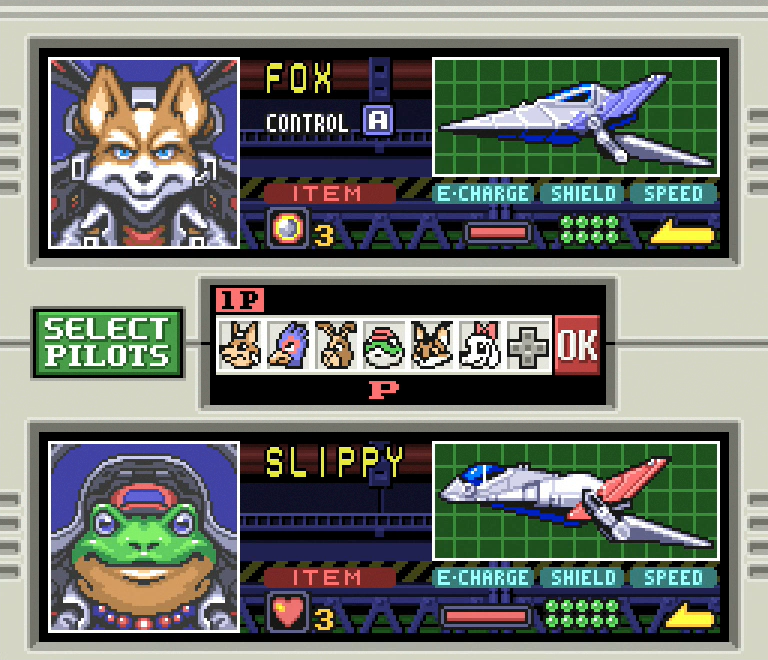 The difference between Star Fox 2 and its predecessor is immediately apparent once you get into the game proper. Instead of a map screen presenting three set linear routes to the finale, there’s an open map of the Lylat system showing the positions of Andross’ forces, the occupied planets and the position of Star Fox, initially in orbit around Corneria. From the outset, you’re given the choice as to what challenge you want to head for, be it a salvo of incoming missiles, a squadron of fighter craft or going straight for one of the occupied planets. Time is frozen on the overview map until you plot a course to follow, at which point the clock starts and the enemy forces start advancing towards Corneria as you move. If an enemy reaches Corneria, it deals damage according to what type of force it is; missiles explode and deal one-time heavy damage, fighters hang around and deal damage over time until destroyed, while battlecruisers charge up a “Planet Cannon” for massive damage. If Corneria reaches 100% damage, you lose, and there’s no way to “repair” it in-game, either. If you intercept something on the map with your ships, you enter a 3D action sequence that varies according to what you’re confronting. 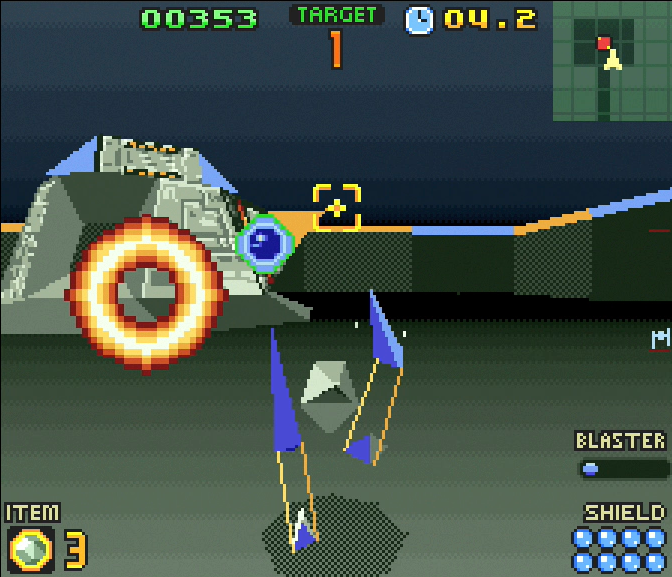 Most unfold in an early incarnation of the “All-Range Mode” found in later Star Fox games, meaning you can freely turn in any direction, change your altitude and pursue enemies as you see fit, making for a much stronger feeling of actual dogfighting rather than the scripted shooting galleries of the original game. To clear one of these encounters, there are several “targets” to deal with. When intercepting missiles or fighters, you simply have to destroy them, but when you descend to a planet surface, things get a bit more complex, requiring you to find switches to open a bunker, then fly inside said bunker and explore a semi-randomised mini-“dungeon” of sorts in order to destroy a reactor and retake the planet. Planetside missions allow you to switch your ship into “Walker” mode. This provides a surprisingly competent third-person shooting control scheme for a controller without dual analogue sticks, with the D-pad taking care of moving forwards, backwards and strafing, turning on the shoulder buttons and vertical aiming handled automatically. There are even some light platforming elements involved here and there, either requiring you to jump onto platforms or even time your transformation carefully while you’re in flight to land on a target area. The randomised elements of the game keep things interesting. 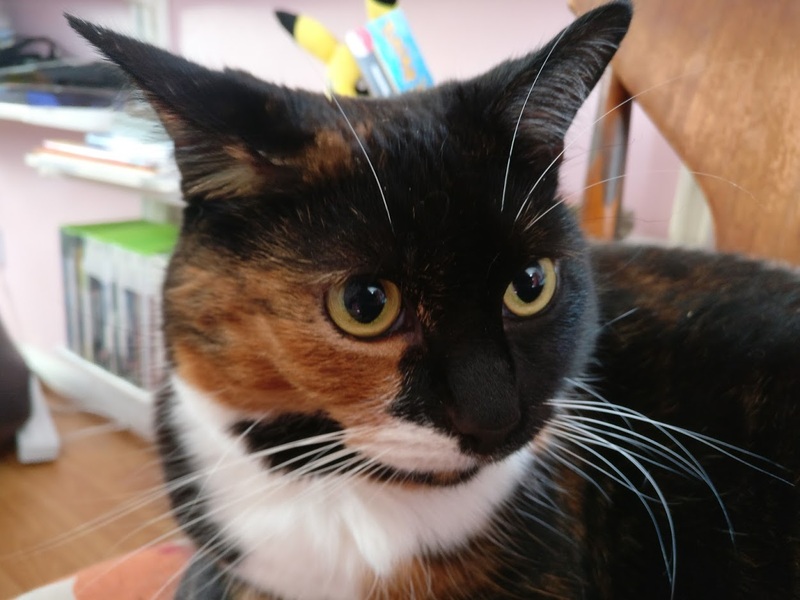 You’ll generally encounter different types of enemies in each playthrough, and sometimes you’ll find yourself up against boss enemies that must be defeated to proceed. 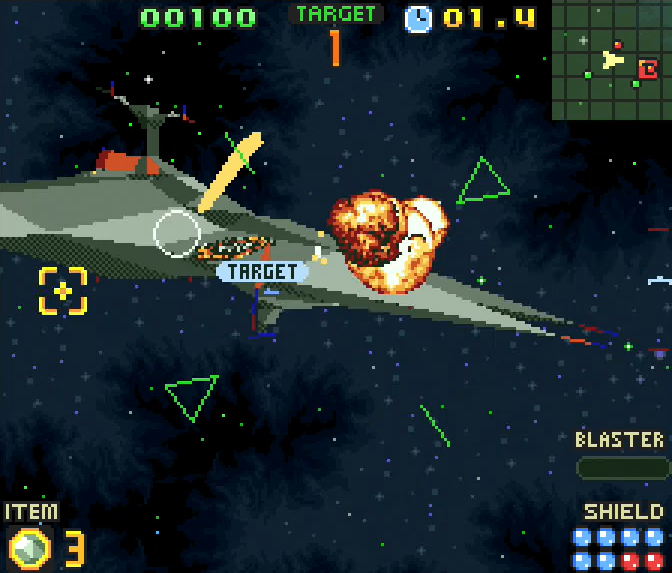 At various intervals, Star Wolf will show up, too, demanding that you dogfight them one-on-one in a tough battle before you can proceed to your actual objective. What makes things even more interesting is that time continues to pass while you’re in these 3D sequences, albeit at a slower rate than on the overview map. This means that while you’re busy flying up the bumhole of one of Andross’ capital ships to destroy it from within, a squadron of fighters could be devastating the surface of Corneria. Can you afford to leave them be for a few seconds while you wipe out the cruiser, or should you abandon your current mission and rush to Corneria’s defense? You can do either. There are additional strategic elements beyond just picking what order to attack targets in, too. 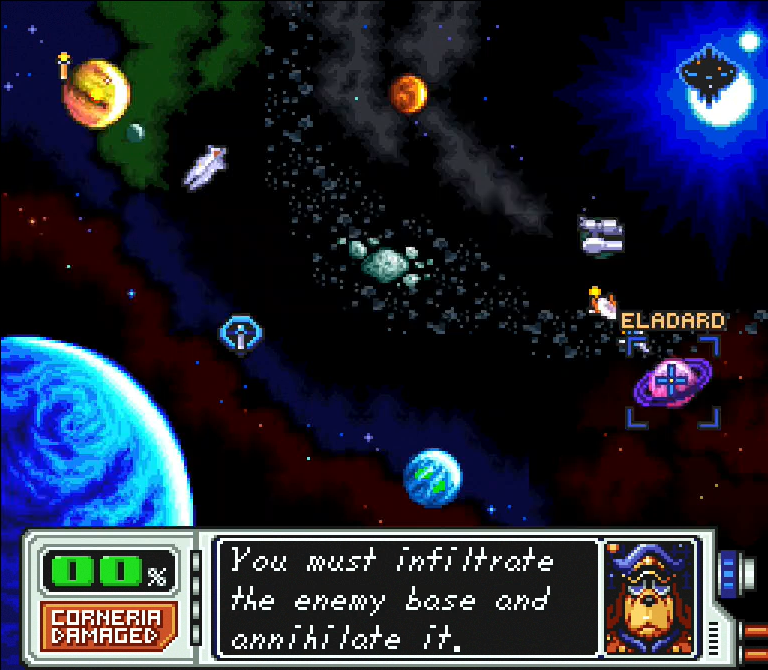 For one, Corneria has an orbital defense platform that can pick off fighters and missiles that are approaching the planet — but it takes a long time for it to charge up, and on harder difficulties it is susceptible to being taken over by “virus” enemies that Andross throws out at periodic intervals, potentially necessitating an emergency recapture operation to prevent Corneria’s own weapons being turned against her. The position of your Star Fox mothership is important, too. Initially beginning in orbit around Corneria, it can be warped for no time “cost” to any liberated planet in the Lylat system, so long as you’re docked with it. Docking also fully restores your shields — there are still shield recovery items in the action sequences, but they can’t necessarily be relied upon to appear — so it’s in your interests to check in every so often and perhaps move the ship to a more strategically advantageous position based on what you intend to do next. Finally, there’s your wingman. At the start of the game, you get to choose the pilot you will initially play as and a wingman. Fox and Falco are the “average” characters, offering a balance between speed, shield strength and attack power and the traditional Nova Bombs as their limited special weapons. Peppy and Slippy fly heavy bombers with more shield strength but low speed, and also have the ability to heal themselves with their special weapons, making them more self-sufficient in the field. And newcomers Miyu and Fay follow the unwritten law of playable female characters by having the fastest ships but the lowest shield strength, as well as a special weapon that makes them temporarily invincible for a few seconds. Your wingman has several functions. Theoretically, they help you out in missions, though more often than not you don’t see them do anything useful whatsoever aside from repeatedly tell you that you can press the Y button to speed up. More significantly, you can swap control between your initial pilot and your wingman on the map screen by pressing Select, effectively giving you a “spare” stock of shields if you take heavy damage. And perhaps even more importantly on the higher difficulty levels, they act as a continue credit; if you get shot down during a mission, you can continue as your wingman, though if they buy the farm it’s all over once and for all. At the end of the game, you’re given a final score according to how you performed. There’s a basic score you achieve simply from shooting things in the game, then added to this are numerous bonuses based on the number of capital ships you destroyed, the number of planets you liberated, how much damage Corneria took and whether or not your wingman is still alive. Most significantly, there’s a bonus according to how long you took; each of the three difficulty levels has a “par” time to beat, and so long as you’re under this when you clear the game you’ll get a significant chunk of points to add to your total. Once you have a total score, you’re given a letter grade to make you feel suitably bad about yourself and then sent on your way to do it all again. It’s this scoring system that provides Star Fox 2’s enduring appeal. It’s not difficult to clear the game — particularly on Normal, which is very easy indeed — but doing so with a top grade presents a significant challenge that requires you not only to be on top form in the action sequences, but also that you carefully plot efficient routes to save as much time as possible on the strategic overview. On top of all that, there are a bunch of hidden medals to find in the various action sequences, too, with a secret base full of weapon upgrades unlocking when you find them all. 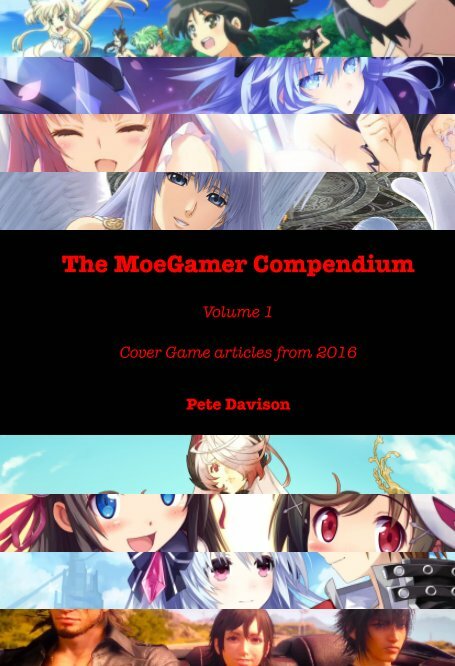 Your five best scores, grades and times are saved for posterity, so you can see how you improve over time — though it’s a little odd that these aren’t stratified by difficulty, since the Hard and Expert modes offer considerably higher scoring potential, albeit at significantly greater risk. This is not a game you will master immediately, so don’t be deceived by how seemingly easy it is to clear Normal mode! Hard mode is where the “real” game starts, and once you unlock Expert you’ll be kept busy for a good long while trying to get that elusive top rank. Star Fox 2 is a great game. 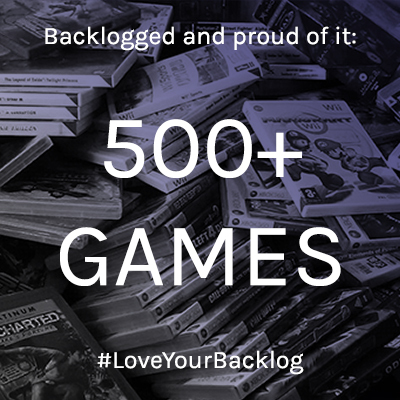 While technically speaking it obviously pales in comparison to modern games — as previously noted, some people may find the inconsistent and frequently janky frame-rate in particular to be a complete dealbreaker — its gameplay is sound. In fact, it’s more than just “sound”; it presents a highly original take on space combat, combining elements of strategy and action to create an altogether unique experience quite unlike anything else from the era. While it’s a shame we never got the chance to play it back when the SNES was “current”, the fact it’s finally here now is very welcome indeed. It’s testament to Nintendo’s continued willingness to experiment with game styles and acknowledge its history — and, perhaps most importantly, a very solid addition to the already strong lineup in the rest of the SNES Classic’s library. I’ve found Star Fox (Starwing for me, in England) and the sequel have aged badly, but they’re just about playable. I can see why Nintendo added them to the SNES Mini but I’d have preferred Chrono Trigger on there along with Earthworm Jim 2. I’d have definitely liked to see Chrono Trigger on there, for sure, if only because I’ve started it umpteen times via emulation and the PS1 version and still never beaten it!